Tweety And Sylvester - Tweety's SOS. Do आप think Tweety is mean to Sylvestar? Which Tweety चित्र do u like? 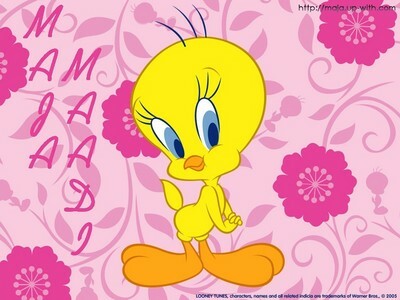 do u have a tweety pillow?????????????????????????????????????????????????????????????????????????????? Does Sylvester the cat fart या burp? Also does he ever stretch out to grab something? Does he get stuck and have to pull himself out? Respond with anything. Tweety Bird (also known as Tweety Pie या simply Tweety) is a fictional Yellow Canary in the Warner Bros. Looney Tunes and Merrie Melodies series of animated cartoons. The name "Tweety" is a play on words, as it originally meant "sweetie", along with "tweet" being a typical English onomatopoeia for the sounds of birds. His characteristics are based on Red Skelton famous "Mean Widdle Kid". Tweety appeared in 48 कार्टून in the Golden Age. The very first टेलीविज़न appearance of Tweety Bird.